Each year, the holidays seem to arrive sooner and sooner. Between jam-packed schedules and everyday distractions, busy shoppers want the perfect gift – right here, right now – and often find themselves crossing off items on their lists at crunch time. Couple that with the change in shopping habits and it’s easy to see why dusting off last year’s strategy won’t work. With data showing that mobile-first consumers are more curious, more demanding and more impatient than ever, marketers must be ready to capture their attention with the quick level of assistance they crave. Consider this: 67% of smartphone users now agree that when conducting a search, they look for the most relevant information regardless of the company providing it.1 Their loyalty is shifting towards whoever can help them with the answer they need in that moment. To respond to growing consumer expectations this shopping season, factor these three insights into your holiday strategy. Another thing we’re seeing is, holiday shoppers are growing more impatient. Yes, they’re willing to invest their time researching gift ideas and where to buy them. But when they’ve made their decision and are ready to purchase, they want shopping assistance that is fast and frictionless – whether it’s online or in-store. While mobile shopping is a big change in consumer behaviour, old habits – including procrastination – remain hard to break. 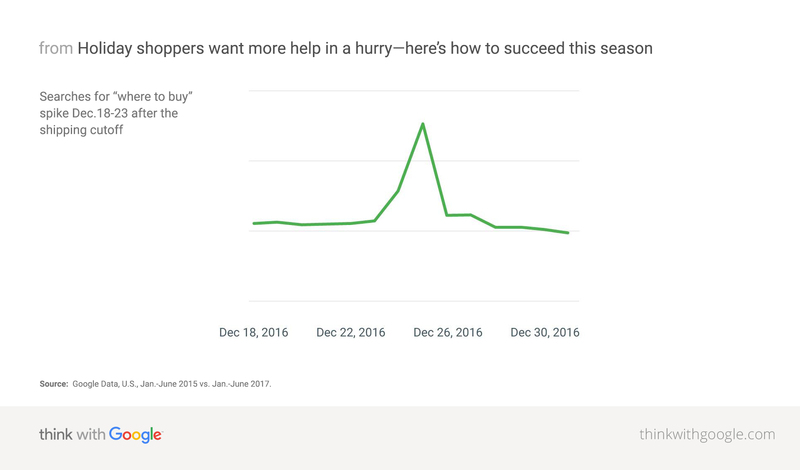 Once it’s too late to deliver, we see that shoppers redouble their efforts to find shop open nearby. So if you're inclined to stop your mobile marketing after the delivery cut-off, think again. Source: Google Data, U.S., Jan.-June 2015 vs. Jan.-June 2017. The “last minute” is getting later and later for holiday shoppers. That said, today’s empowered consumers still expect to be able to buy – and do so seamlessly – right up to Christmas Day. Source: Google Data, U.S., Nov.-Dec. 2016. That’s a whole lot of viewing, but it’s more evidence of the many distractions vying for today’s consumers’ attention. Retailers must never forget that shoppers’ time is a crucial commodity – especially during the holidays. Keep that in mind and you’ll be in a better position to help them in a hurry this shopping season, both in and out of your shops. 3 YouTube Data, U.S., “Classification as Store Tour" video was based on public data such as headlines, tags, etc., and may not account for every such video available on YouTube, Jan.-June 2015 and 2017. 5 Google Analytics, U.S., July-Sept. 2017. Based on data from Google Analytics accounts that have authorized Google to share website data in an aggregate way. 9 YouTube Data, U.S., Mobile, Classification as Shopping video was based on public data such as headlines, tags, etc., and may not account for every such video available on YouTube, Jan.-June 2015 and 2017.